You must consider your own human feelings and emotions prior to euthanizing any animal. If you don’t think that you can handle killing a frog, then direct someone that you trust to do this. Frogs and other amphibians can survive freezing temperatures for extended periods of time. Don’t just pop a conscious frog into the freezer without applying benzocaine first. Benzocaine ointment is typically used for toothaches in humans and is available from any pharmacy. When it’s necessary to kill a frog or any other living creature, you must treat the animal with the utmost respect. Euthanasia, or “good death” emphasizes the importance of ensuring the animal experiences as little fear, distress and pain as possible as it passes away. 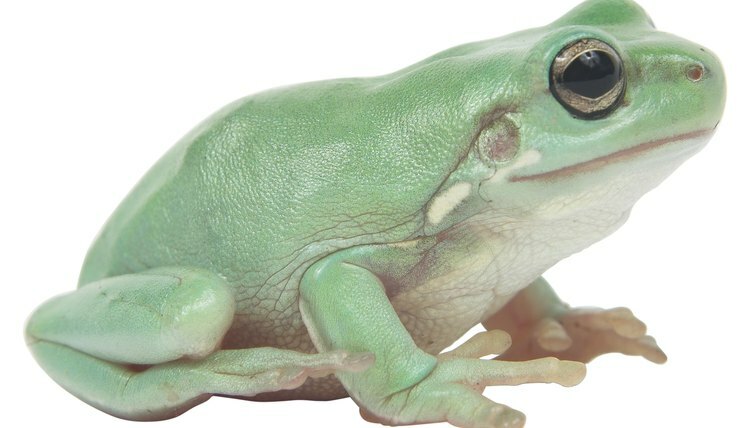 This means that you should employ a humane technique that causes the frog to lose consciousness quickly, followed by respiratory or cardiac failure. The result is rapid cessation of brain function and painless death. Pull on a pair of disposable gloves. Remove the cap from a tube of benzocaine ointment and set it aside. Hold the frog with its backside up. Squeeze a 1-inch long strip of benzocaine ointment on its spine from the bottom of its skull downward. Spread the benzocaine down the rest of the frog’s spine to its tailbone. Place the frog gently into a plastic shoebox. Poke a few air holes in the lid and cap the shoebox tightly to prevent the frog from escaping. Set the box on the counter at room temperature for about 45 minutes. The animal will be groggy in about 10 minutes, and unconscious in about 20 minutes. In 30 to 45 minutes it will be dead or near death. Seal the unconscious frog tightly in a plastic bag. Place the bag in the freezer for at least 72 hours. It’s important to freeze the frog deeply to ensure that it does die, and that it isn’t merely alive but heavily drugged before you dispose of the body. Check the frog after three days to determine that it is really dead. Watch it for a few moments to see if it looks like it’s still breathing. If not, turn it over onto its back. If it doesn’t flip back over to right itself immediately, the frog has passed away. Dispose of the frog’s body in the trash.